MINNEAPOLIS -- Draymond Green had 24 points, nine rebounds and six assists to help the Golden State Warriors narrowly avoid their first two-game skid in nearly a year with a 109-104 victory over the Minnesota Timberwolves on Monday night. Klay Thompson scored 17 points and hit all five of his 3-pointers, and the Warriors (63-7) overcame a second straight poor shooting night from Stephen Curry. The reigning MVP missed 11 of his 17 shots, including seven of his nine 3-pointers, but still had 19 points, 11 assists and seven rebounds. Karl-Anthony Towns had 24 points and 11 rebounds, while Ricky Rubio added 20 points, 11 assists and four rebounds for the Timberwolves (22-48), who gave the defending champs all they could handle. The last time the Warriors lost two in a row in the regular season was April 5 and 7, when they were starting to turn their eyes to the playoffs. This year, in spite of their record-setting start, they still entered the game just three ahead of San Antonio in the Western Conference. They are not only chasing the top seed in the West, but are no longer hiding their desire to break the 1995-96 Chicago Bulls' record of 72 wins in a season. The Warriors are currently ahead of that pace. Nothing is yet guaranteed for these Warriors, who are getting every team's best shot every night. And Monday was no different. The Warriors were short-handed, playing without Andrew Bogut (left foot), Andre Iguodala (left ankle) and Festus Ezili (left knee), and they had their hands full with the precocious Wolves. The Wolves gave white towels to every one of the fans, and the first sellout crowd of the season responded with full-throated enthusiasm as their young team went toe-to-toe with mighty Golden State. The Warriors were coming off of a shockingly poor offensive showing against the Spurs. They scored just 79 points against the aggressive San Antonio defense and Curry went 1 for 12 from 3-point range and 4 for 18 for the game in their 33rd straight loss at the AT&T Center. They have bounced back from a loss each time, and the Timberwolves braced for an early haymaker that didn't come. Minnesota turned the ball over seven times in the first quarter while working out the jitters of playing in front of a full house for once, but shot 61 percent against a Warriors defense that looked a step slow. Thousands of blue-and-yellow clad Warriors fans formed long lines out of the Target Center more than two hours before the game and some even stood in a skyway overlooking First Avenue in hopes of catching just a glimpse of Curry and the NBA's rock stars as they left their hotel to get onto the bus. Then they watched the hometown team throw everything it had at the champs. Minnesota ripped off a 10-0 run in the third quarter to take an 89-81 lead, with Rubio orchestrating the pups Andrew Wiggins (25 points), Towns and Zach LaVine (19 points) up and down the court. Golden State responded with an 8-0 burst of its own, but nothing came easy for a team that has lit up the league for the last two seasons. Most of Curry's highlights came on rainbow heaves a split-second after a foul was called, and the Warriors went 15 for 24 on free throws to keep the door open for the Wolves, who took a similar approach to San Antonio and switched almost every screen on defense. Curry missed a wide-open look with three minutes to play and a 101-99 lead. Towns tied it with a runner, but Green scored on two tough layups to hold off the Wolves. Warriors: Bogut received an MRI on his bothersome left foot/toe that was scheduled to be reviewed by medical staff Monday night. ... Ezeli is making progress in his return from surgery on his left knee six weeks ago, the team said. He is expected to start practicing soon. ... Coach Steve Kerr started James Michael McAdoo at forward for the first time in his career, one game after putting Brandon Rush in that spot against the Spurs. 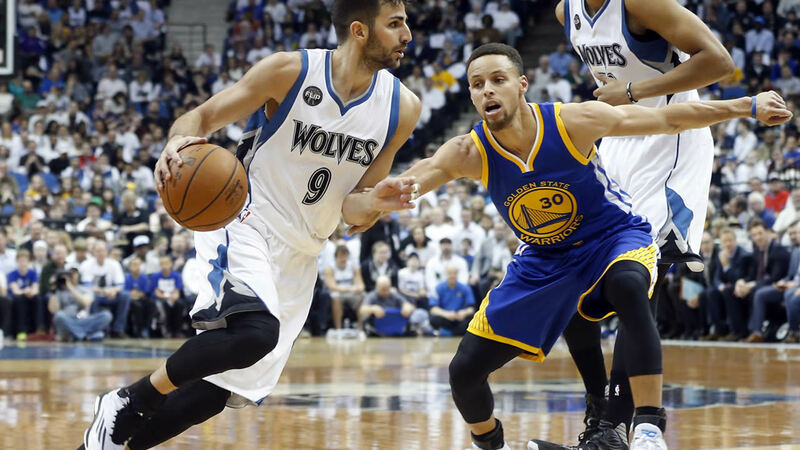 Timberwolves: Their 18 turnovers led to 23 points from Golden State. ... Minnesota's bench was outscored 36-8. ... Rubio (3 for 7) hit more 3s than Curry. Warriors: Host Clippers on Wednesday. Timberwolves: Host Sacramento on Wednesday.